"My little horse must think it queer"...with all due respect to Robert Frost, that line made our entire 6th grade class laugh when our teacher read it. 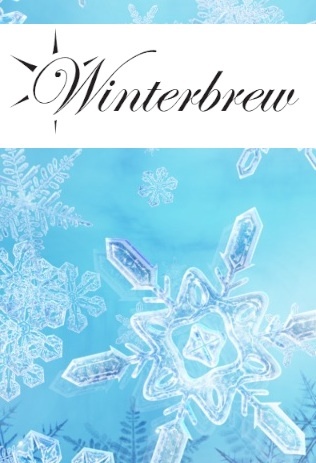 That poem came to mind after looking at the art for the upcoming Winterbrew event slated for this Friday, February 3. Thirteen breweries:Santa Fe Brewing Company, Second Street Brewery, Marble Brewery, Blue Corn Brewery, Chama River Brewing Company, Tractor Brewing Company, Il Vicino Brewery, Turtle Mountain Brewing Company, La Cumbre Brewing Company, Nexus Brewery, Sierra Blanca Brewing Company, Rio Grande Brewery and Monks' Ale will gather at the Santa Fe Farmers Market Building to celebrate the season. It is also the first NM Brewers' Guild event put on since hiring a person to basically get everybody in the Guild on the same page. Can you imagine trying to get a roomful of brewers to agree on anything? Good luck, Chris! The $15 Winterbrew ticket gets you a commemorative glass along with five tickets good for five beer samples. You may purchase additional drink tickets for a buck apiece. Small plates from a number of Santa Fe eateries including Rio Chama, Zia Diner, Junction, Epazote, Second Street, Flying Star, Whoos Donuts, Whole Foods, Slurp, and others will be sold for $1-$4 each. I'd like to see Bobcat Bite there with some burgers, then maybe that Bon Appetit magazine guy who is always on TV and looks like he should be in Nickelback would show up. As far as the beers go, expect winter-appropriate styles like Stouts and Porters as well as the usual favorites from the breweries in attendance. You can pick up your ticket at one of our locals (Marble, Chama, Turtle Mountain, La Cumbre, Santa Fe) or at the door. The RailRunner station is only a few blocks from the Winterbrew location and a 9 pm train will get you back to Albuquerque in time for bar-hopping.